After weeks of negotiations, Sony Pictures TV has made a deal with Yahoo to produce season six of Community, the low-rated NBC sitcom that was cancelled last month. The cast’s options were set to expire today so the deal truly comes at the 11th hour. Community creator Dan Harmon will return as executive producer along with Russ Krasnoff, Gary Foster, and Chris McKenna. Season six of Community will be released this fall on Yahoo Screeen. What do you think? 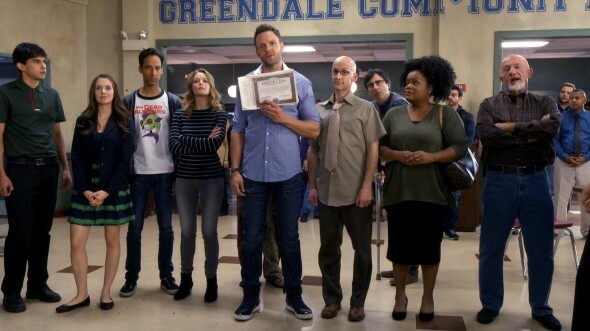 Are you glad to hear that Community will have a sixth season after all? Community: Season Seven Cancelled; But Movie Is Still In The Works? Community: Season Seven or Cancelled Again? Community: Season Six a Possibility for Hulu? I love Community! Great writing and acting. I like the relationships. I especially love Abed, Troy and the Dean but I like them all and they make Community the excellent show that it is! It’s funny with depth- great combination. I have no idea what yahoo screen is, but I’ll gladly pay for season six! Now, let’s talk about that movie..
One of the better network comedies of recent years; humor is quite warped, which I love. Never missed an episode, & I’ll continue to watch online; very happy w/the news. It wasn’t worth watching on TV, so why watch it online.